In the medieval period, as in the media culture of the present, learned and popular forms of talk were intermingled everywhere. They were also highly mobile, circulating in speech, writing, and symbol, as performances as well as in material objects. The communication through and between different media we all negotiate in daily life did not develop from a previous separation of orality and writing, but from a communications network not unlike our own, if slower, and similarly shaped by disparities of access. Truth and Tales: Cultural Mobility and Medieval Media, edited by Fiona Somerset and Nicholas Watson, develops a variety of approaches to the labor of imaginatively reconstructing this network from its extant artifacts. 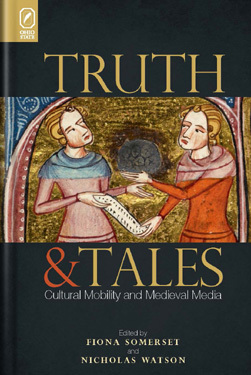 Truth and Tales includes fourteen essays by medieval literary scholars and historians. Some essays focus on written artifacts that convey high or popular learning in unexpected ways. Others address a social problem of concern to all, demonstrating the genres and media through which it was negotiated. Still others are centered on one or more texts, detailing their investments in popular as well as learned knowledge, in performance as well as writing. This collective archaeology of medieval media provides fresh insight for medieval scholars and media theorists alike. Fiona Somerset is professor of English and medieval studies at the University of Connecticut. Nicholas Watson is professor of English and medieval studies at Harvard University.